This explain the reason Buhari left for London to consider options of the Attorney General and his Vice President, who both lawyers legal advice. Some Supreme Court judges may face sack, prosecution over briberyallegation Scandalised and embarrassed by their ridiculous judgements. Especially in the Akwa Ibom, Rivers and Abia State Governorship Election Appeal. President Mahammadu Buhari is set to carry out drastic and unprecedented shake up and reforms in the judiciary. Feelers from the presidency indicates that a major tsunami may soon hit the Nigerian judiciary which may result not only the probe of the Supreme Court judges who heard the Akwa Ibom, Rivers and Abia Governorship Election Appeal, but may lead to the dissolution of the entire Supreme Court judges. The outrage that greeted the apex court verdict allegedly forced the President to embark on a 5- day vacation to London and the elevation of the Vice President, Prof Yemi Osinbanjo to the position of Acting President. There are strong feelers that Buhari decided to boycott spending his vacation in Daura his hometown in Katsina to avoid the pressure from Nigerians who may want to meet him and persuade him to soft pedal in his plans to rid the judiciary of corruption and corrupt judges as well as his ongoing anti corruption war that has already claimed many high profile Nigerians. Buhari who was reported to have been angered by the decision of the apex court to uphold the elections in Rivers State considered the worst ever in the history of Nigeria is currently weighing available options. He was said to have allowed his Vice become Acting President while he is away to enable Osinbanjo who is a Professor of Law and also a Senior Advocate of Nigeria (SAN) to do some preliminary findings that will be presented to Buhari on his arrival from his London vacation. Also the Minister of Justice and Attorney General of the Federation, has been mandated to brief the President on the implications of allowing the judgement to stand on the country's legal and electoral system as well as suggests possible line of action available to the President to explore. 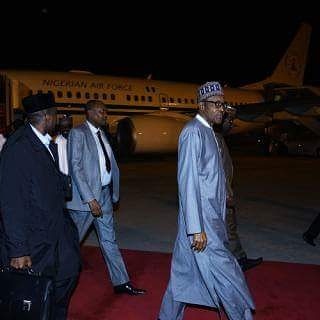 A close door meeting between the President, his Vice, the Attorney General of the Federation, the National Security Adviser as well as the Chief of Staff to the President will be held once Buhari arrives Abuja. According to reliable but yet to be confirmed sources. Meanwhile, palpable fear has gripped judges of the apex court most of whom have been accused of receiving and shared huge sums of money from the Akwa Ibom State Government to subvert justice. The judgement was allegedly delivered in PDP's favour after Akpabio allegedly paid 70 billion NAIRA to the seven man panel through Jim Ovia of Zenith bank. A covert investigation might have already begun on the orders of the presidency to get to the root of the matter. A source at the Supreme Court confessed that even some retired Supreme Court judges are alarmed and scandalized as well as the rest Nigerians over the judgement. presidency over the possible action of the President once he comes back from his vacation as there are fears that Buhari may go on an all out offensive against the judges. President that the judiciary remains his greatest concerns in his anti corruption war.